PL is a healthy 66-year-old female. She developed coughs sometimes in late 2011. The medications given by her doctor did not help with her coughs. 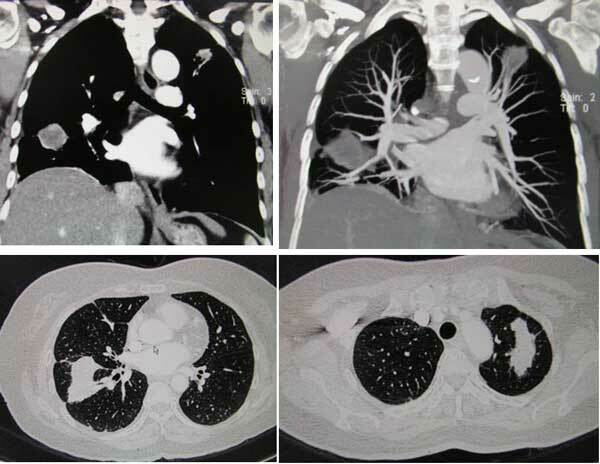 A CT scan done on 2 November 2011 indicated a 3.2 x 3.8 x 4 cm nodular lesion at the right lower lobe of her lung. Another elongated poorly enhancing lesion is seen at the left apex, measuring approximately 2.2 x 2.3 x 4.8 cm in size. In addition there was mild right pleural effusion (fluid in her lung). This made PL breathless, listless and devoid of energy. PL underwent pleural tapping. Her condition improved after fluid was tapped out of her lungs. Unfortunately, a week later, the fluid came back again. Another tapping was done. The doctor suggested that PL do a biopsy. PL refused. A week later, the fluid recurred in the lung and PL has to undergo another tapping. And after the procedure PL agreed to do a biopsy. “Gluing procedure” or pleurodesis was carried out after the pleural tapping but this was not effective. A tru cut biopsy of the mass at the lower right lung was performed and it confirmed a well differentiated adenocarcinoma of the lung. A report dated 21 November 2011 showed that the tumour was positive for EGFR (epidermal growth factor receptor). This means, the use of the oral drug, Iressa was indicated. PL was given two options: to take Iressa for her cancer or to undergo chemotherapy using a combination of Alimta and Cisplatin. PL opted for the oral drug, Iressa. On 1 December 2011, PL was started with Iressa. Her condition improved but after three months she started to suffer severe side effects. 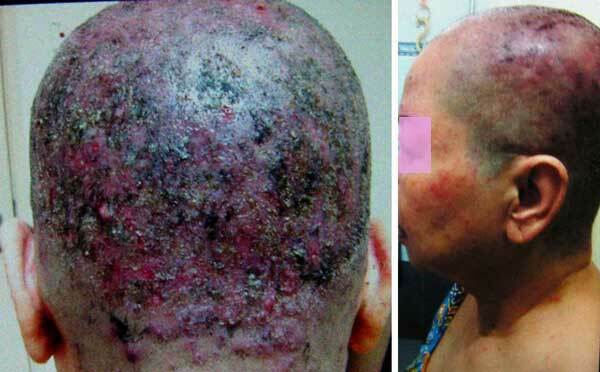 She developed pimples and sores with pus on her head and later had rashes in the face, neck and pubic area. She was referred to a skin specialist for help. She shaved her head bald. She was told to stop taking Iressa and her problem resolved after two weeks. She resumed Iressa, her rashes and sores and pus recurred. This recurrence went on for three times. On 8 August 2012 – after being on herbs for about three weeks, I sat down to talk with PL in greater detail. The answer is yes. The initial problem of fluid kept recurring after each pleural tapping. But after taking Iressa the fluid stop recurring. PL’s health normalised. 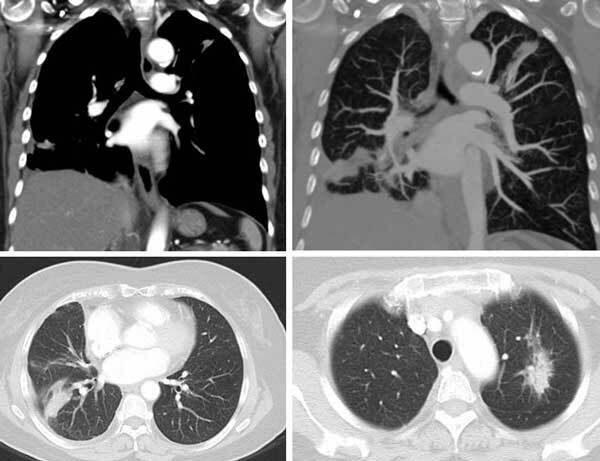 A comparison of the CT scan done on 2 November 2011 and those done on 20 February 2012, showed the tumours in her lung had shrunk significantly. That is what patients and oncologist hope for! The medical doctors of the Evinta Medical Center, Arizona, USA (http://www.envita.com/) said: By and large cancer growth response, or “shrinkage,” remains the primary focus of cancer treatment. Unfortunately, research demonstrates that such responses do not often correlate to elevated survival in patients. When traditional cancer treatment reports a 20 or 30 percent effect, it simply means that the patient’s tumor shrunk by 20 to 30 percent. This is deceptive because the cancer typically grows back, oftentimes larger, and resistant to the chemotherapy. The real measure is how long life is sustained and its quality therewith. Envita is results oriented and we measure our success in terms of tumor change, as well as the long-term outcomes and quality of life experienced by our patients. This continues to be our driving force for developing and perfecting unique, quality treatments for our patients. The answer is NO. The oncologist told PL that it all depends on the person. In other words, different people respond differently. Some patients survive for one year, others two years and some even survive five years. But all of them still die even after taking Iressa. PL was told that she has to be on Iressa for as long as she can afford it. But there is no knowing how long she can survive. This goes to say that actually it is n=1. Whatever research that is done – and whatever percentages that are bashed around to impress patients – it does not apply to PL at all. PL has to take the Iressa and only she would know what can happen to her. So, this is what they call, scientific medicine! Before taking Iressa, PL was told about some possible side effects. But what actually happened to PL was beyond expectation. According to the oncologist it was the worst side effects he had ever seen! Whatever it is, scientifically proven drug can cause such problem. I posed this question to PL: Since Iressa helped you and make you well – why do you want to stop taking it? At least this can take care of your lungs. PL: I would rather die than suffer. I want to live and enjoy my life. I don’t want to suffer. I posed another question: Do you mean to say that the side effects of Iressa are so bad that you would rather die than live? You cannot live with the side effects? PL replied that it was indeed hard to live with such side effects. Pus oozed out of the sores. Sometime it became itchy. Sometime it was painful. So the cost of survival in terms of side effects is not worth it. This does not take in consideration the cost of the treatment yet. A full dosage of Iressa costs about RM 6,700 per month. It is good that PL’s health insurance paid for the drug every month. What if there was no insurance coverage? Since PL decided to stop taking Iressa, the oncologist offered her chemotherapy, telling her that these days chemo-drugs are mild and more “friendly” and do not have all those dreadful side effects. I asked PL what drugs the oncologist was to give her. PL did not know except to say that it would be a mild one. Let me tell you a story about Alimta. KP was a Malaysian who lived in Perth, Australia. He had lung cancer that had spread to his liver. He underwent chemotherapy and at the same time took herbs. He did well and this amazed his Australian oncologist. Unfortunately, a scan showed that there were still traces of tumours in him. The oncologist suggested more chemo – this time with a combination of Avastin + Alimta. KP called me from Perth one morning and asked if he should go ahead with this treatment. I said: NO. After all you are doing fine. Why take the risk? Learn to live with your tumour! I did not get to hear from KP again after that. The gist of the story is, KP did not follow my advice. He went ahead with this so called new, state-of-the-art concoction! By then it was too late. KP was in severe pain and his stomach was bloated. There was nothing much I could do to help. On 18 September 2011 KP died. Comments: I advised PL to learn to live with the tumours in her lungs. For as long as she can lead a normal life, be grateful for each day when she awakes! Don’t expect the herbs to cure her lung cancer! I don’t even expect the tumour to shrink after taking the herbs. Almost all patients die because of metastasis and not just because of the tumour! Of course, patients want magic – they want their cancers to go away completely. But there is no magic. We have to learn to accept that reality. PL’s oncologist said herbs are not scientifically proven! Well, patients have to make their own choice. Do what you think is right. Follow your heart! Remember, sometimes the head can lead you astray! I wonder too about Alimta. Is it ever proven to cure cancer? No? What would happen if PL were to undergo chemotherapy with Alimta + Cisplatin? Would PL end up like KP – dead? Maybe yes, maybe not! No one can tell for sure what is going to happen. So what is the use of scientific proof then when you can even predict the outcome? In the same way – learn this bitter lesson – no one could predict or tell that PL had to suffer such severe side effects after taking Iressa. Others, the oncologist claimed, did not have such problems. Perhaps Alimta is also very safe for PL? Try your luck if you wish. Lung Cancer: More than two years on herbs and no chemo! 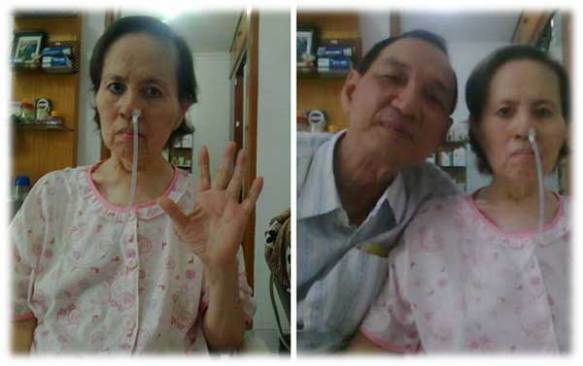 Let me briefly relate the story of Suri, an Indonesian lady with lung cancer. Being rather well off, Suri’s husband decided that she must have the best. So they went to Singapore for treatment – gunning for the so-called proven, scientific treatment. 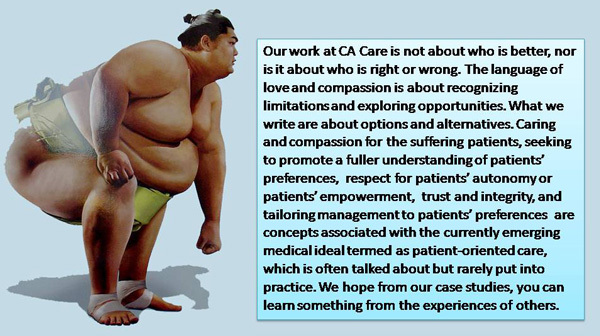 Before they went for treatment in Singapore, their relatives in Penang had suggested that they try the CA Care Therapy. The husband vetoed the idea. He said: I refused to entertain that idea. In my mind, that is all hocus pocus. How can herbs be better than the doctors in Singapore? Herbs are just traditional stuff and if they are that good then all doctors will have to close shop. So I dismissed the idea of taking herbs as being absolutely nonsensical. In Singapore Suri underwent 22 times of radiation treatment, followed by oral drug Iressa. She took Iressa for about a year. Her tongue became numb and so she gave it up. The doctor then gave her Tarceva – another scientifically proved drug! She was on this drug for about two years. A year later, in 2009, the cancer spread to her brain. She underwent chemotherapy. In total she received 40 chemo injections – also using the so-called FDA-approved, scientifically proven drugs! Nothing seemed to work for Suri. As a last resort, her oncologist asked her to take Sutent – another scientifically proven drug laden with all kinds of side effects. I asked her husband: Before she took Sutent, did you not ask if the drug can cure her? He replied: No one dares to answer such a question. The oncologist told me, “I cannot say. The only one who knows the answer is the One Up There!” An interesting answer indeed! The god of science has failed to save. We are now told to trust the ordinary God that you and me believe in! After Suri took Sutent her consumption of Panadol gradually increased from one tablet per day to six tablets per day. She stopped taking Sutent! Now, all possible, scientifically proven drugs have failed. Hopeless and helpless, Suri’s husband decided to come and see us in Penang – to try our so-called unproven, unscientific therapy that has PROVEN to help a lot of other people. On 8 May 2011 Suri was wheeled into our CA Care centre, being unable to walk on her own. She was unable to talk, showed no facial expression and did not seem to know what was going. According to her husband, she behaved like a child. During this visit, I must honestly say I did not expect her to survive much longer. But with God’s grace, a miracle happened. Suri recovered. You can listen to this amazing story by clicking the links below. On 6 August 2012, I got an e-mail from Pak Teddy in Jakarta. Hello Prof. Chris: This morning Suryana Tukiman called me and we had a talk. Now his wife has already started to take our herbs again. According to him the Neurosurgeon was surprised to see the MRI result of the brain – full with white patches but she is still alive and healthy after 1.5 years taking our herbs. The paralysis is due to the tumor pressing onto the motor nerve. Now they use the NGT to pass food, juice and herbs into her stomach. But as you can see on the photo she looks healthy, only a little bit skinny. These photos were taken this morning after Tukiman finished talking with me. I asked him to take these photos so I can send it to you. Teddy. In my interview with Suri’s husband, I regretted – Money Does Not Buy Cure, he said:For all the treatments – radiotherapy, Iressa, Tarceva, chemotherapy and Sutent – the total cost came to more or less 2 milyar rupiah which is about S$300,000 (almost hitting 0.7 million ringgit?). The cost of one tablet of Tarceva is S$195 and she took this for about 2 years. One tablet of Sutent cost S$210 and she took this for a month plus. One chemo cost about S$7,000. I was curious about one expenditure item of S$120.00. After an enquiry I was told that it was the cost of the chair (plus services provided) which my wife sat on while receiving chemotherapy. The doctor’s consultation cost S$150.00, if I am not mistaken. I was also told to only buy the drugs from the doctor. I was told that cheaper drugs bought outside the oncologist’s clinic could be a fake. I believed everything what the doctor told me. It is okay to spend that kind of money if there was a cure. But there was no cure. I regretted for going to Singapore for the treatment. Let me confess. I was full of remorse. I regretted. Let me conclude: It is true. Herbs are not scientifically proven. But perhaps, this question is only good or relevant, if you want to do a thesis for a higher degree or pass your university examinations. In real life, does it matter if something you do is scientific or not, provided it does the work – effective and not harmful! Let us not be naive. The treatment of cancer is not only about the hard science or proof of effectiveness. It is about maintaining the status quo and fueling the greed of the Vested Interests. 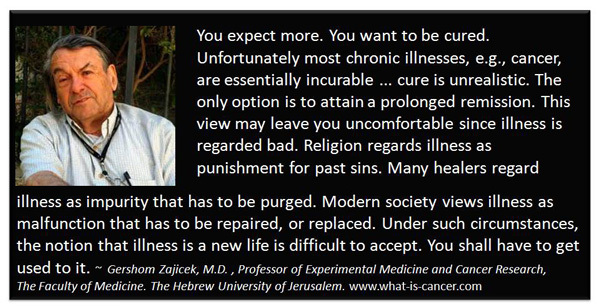 Understand that the politics of cancer is indeed tragic – all played out at the expense of the sick. This entry was posted in Lung Cancer and tagged CA Care Therapy, herbal therapy, Iressa, lung cancer by CA Care. Bookmark the permalink.